50 leaf Desk Jotters and pad printing service. Everyone uses jotter pads but are they using yours? See the 'More Details' tab for further information. Next time your customer or prospect reaches for a notepad make sure it's your name they see! Everyone loves a freebie and what could be more useful than notepads? We all use them daily and because they're used so frequently, they're one of the most cost-effective forms of advertising you can do! 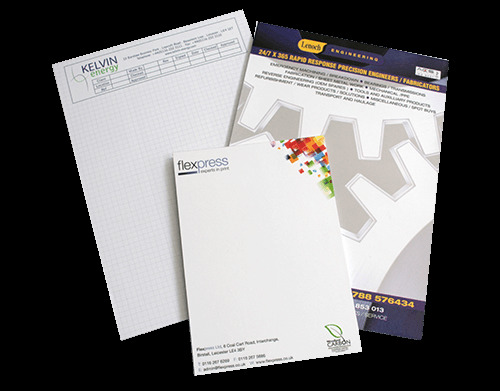 Flexpress printed jotter and desk pads are glued with special glue and come with 50 or 25 easy tear-off leaves per pad, each pad backed with 1000 micron (1mm thick) greyboard. You can expect the same highest quality printing and environmentally friendly materials as with all our other products. Why choose Flexpress for desk and jotter pads?